Relaxation is great! What is not great is winding away your restful hours in a rocking chair that cost too much. There are ways to buy a new wooden rocking chair that do not involve giving up quality for a cheaper price. There are lots of wooden rocking chair bargains online. Say what you will -- these things rock! 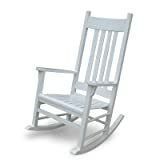 I took a good, long look at the many wooden rocking chairs available on Amazon. To me, the key to what is the best wood rocking chair exists in customer satisfaction, and in pricing. 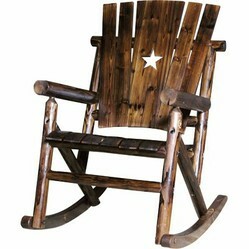 Thus, I really have to say the Lakeland Mills Cedar Log Rocking Chair is the best choice for your money. 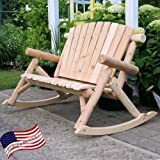 This chair features curved slats for comfort, is made in the U.S.A., and would work as an indoor or outdoor rocking chair. As of today, it sells for $125 on Amazon -- with a slew of positive reviews. There are multiple ways to save a nice percentage of the price of a new wooden rocking chair. One thing you could do is buy an unfinished wood rocking chair. These items typically can save you half the cost -- because you are buying a wooden rocking chair that is unfinished, thereby saving on the materials and labor of a finished chair. While shopping out there in the place where other people dwell, be sure to check out a Cracker Barrel restaurant and general store if there is one near you. As you may know, those folks are always happy to sell you a new wooden rocking chair. Catch them on a sale day and you'll be golden! Also, you can sometimes find the treasure of a gently used wooden rocking chair at your local neighborhood Goodwill Thrift Store, if you are patient and not "married to" one particular style of rocking chair. 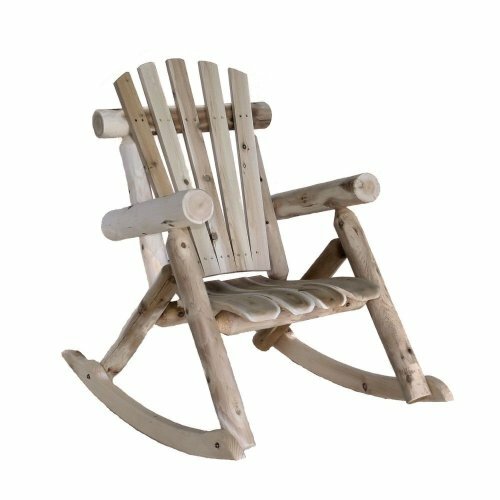 As you shop, I hope you find a wooden rocking chair that pops and helps you smile about your home decor. Yeah, they look good, don't they!